1) Picture was the first real Dutch heavy metal band. Formed in 1979, they were especially popular in the Netherlands, Germany and Italy for their live performances. They still have a huge fan base in South America, Mexico and Japan. Picture supported AC/DC, Ted Nugent and Saxon in the Netherlands. With Saxon, they did a full European tour in 1981. Later on they toured with Rose Tattoo in Germany and headlined tours in Italy and Israel. Rinus Vreugdenhil and Laurens Bakker originally got together in 1977 and started jamming with various musicians. It wasn't until 1979 that the classic lineup of Rinus, Laurens, Jan Bechtum, and Ronald van Prooijen came together. Jan came first and as they auditioned singers, Ronald, who they all knew, decided to step in and audition. After one session, Jan, Rinus, and Laurens decided Ronald was the man, so the classic Picture was born. Early on in Picture's career they teamed up with manager Henk van Antwerpen and signed to the label Warner Bros. Records. However, Picture felt their label were trying to steer them in a pop direction and quit the label to sign with Backdoor Records, a subsidiary of Phonogram Records. The original line-up recorded their debut album and their second effort, Heavy Metal Ears in 1980 and 1981 respectively. They started gigging throughout the Netherlands and nearby Germany and built a following. In the meantime, they started composing their own music. Jan would usually come up with the riffs, then the other members would contribute their parts and after hashing and rehashing the songs, they became the titles that appeared on the first album, Picture I. After gaining record label interest, they went into the studio. As a bunch of young kids, they didn't know much about the realities of recording. When the album came out, none of them liked the sound quality. As they grew in popularity, they went in to record Heavy Metal Ears and it was much the same. It wasn't until they were a little older and wiser that they really got their sound in the studio with Diamond Dreamer. However, by this time, Ronald had left for personal reasons and they found Israeli singer, Shmoulik Avigal. Not only was the recording much better done, but Shmoulik had a different and some say, more powerful voice. Many say Diamond Dreamer was the band's best album. Touring was a hit or miss prospect. The record company did not want to put up enough money to really get behind the band and some great opportunities were missed. Despite all, Picture developed a large fan base covering much of Europe and South America. Band consensus confirms their best gigs were touring with Saxon while the worst was when they played with Rose Tattoo, during the Heavy Metal Ears period. They were not happy with the road crew, plus they were more popular in Germany than Rose Tattoo and some of the band felt they were sabotaged. After recording and touring with Shmoluik for the Diamond Dreamer album, he suggested they add a second guitarist to fatten their live sound and Chris van Jaarsveld was brought in. Though he was a technically proficient guitarist, he just didn't gel with Jan and things went downhill. Then Shmoulik got in a petty argument with their manager and was fired from the band. About this time, Jan had enough and quit for personal reasons. To fill in the gaps, a new singer, Pete Lovell was recruited along with a second guitarist, Henry van Manen. This album was slicker than Diamond Dreamer and the two guitarists significantly altered the heavy sound of Jan Bechtum for a more technical groove that sort of worked, but started the trend for the final albums that veered away from the Picture sound. Around this time, Laurens could not take the rigors of touring or the stress of all their management troubles while supporting a wife and twins, so he called it a day. From that point on, the only remaining original member was Rinus. He soldiered on for three more albums, Traitor, Marathon, and Every Story Needs Another Picture. Many described them as going into hair metal, very commercial and with anonymous songs. Rinus is particularly disgusted with Every Story Needs Another Picture, as it was an album forced by the record contract and it is rumored the whole album was recorded by studio musicians and minimal participation from him. Though Rinus soldiered on long after the other original members had left, he was never able to steer the band back into a successful direction and finally called it a day and got a "real" job. The original members tried a reunion in 1988 and the chemistry was still there. Unfortunately, management reared it's ugly head and unknown to the band, their manager was asking an outrageous amount of money for them to play, so they never got any gigs after their one reunion concert. To have this happen after being burned by management the first go-around was just too much, and once again, they called it a day. As of late 2007, the classic lineup reunited for rehearsals. They still have that spark and plan to cut a CD in 2008 and play some gigs around the Netherlands and Germany. Though Ronald van Prooijen is helping out, singer Pete Lovell (vocalist on Eternal Dark and Traitor) will be their established singer. Rob van Enkhuizen (guitarist on Marathon) also joins the band to boost the live performance. 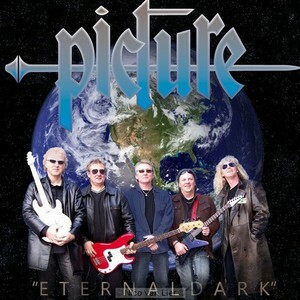 In 2008 Picture starts performing again and even plays the famous Sweden Rock festival in June. 2) Picture's music is deeply engaging and dramatically constructed. Brushed with midnight blues and electric purples, it's a summer sky bright with constellations. The tracks are built from a pastiche of electronic elements sourcing sounds of strings, synthesizers and percussion instruments. Picture is David Kyhlberg from enigmatic Swedish production duo, Sail A Whale. This is his first solo effort.